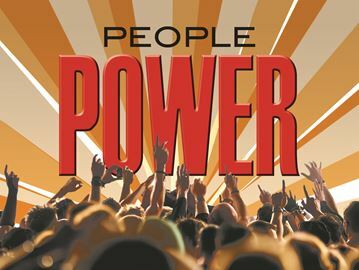 For the first time in my 65 years of existense, the phrase "Power to the People" is more than just a slogan. When I was a teenager in the Sixties, it seemed like every group was using it. The Black Panthers, hippies and radicals had that in common. It's not like people didn't join them; it's just that most of the time the slogan was more of a siren call than anything really effecting change. The hippie's philosophy of free love and flowers floating in air faded away with too many LSD trips, quietly disappearing into the "Me" Seventies. Radicals, like the "Weather Underground," called on anarchists and disenfranchised minorities to wage war in America's streets. Their version of people power was more like a scene from the apocalypse. In the end, the group perished in a fiery shootout with police. Then there were the Black Panthers. Their message of "Power to the People" carried revolutionary tones and called for a new society where African Americans would be treated equally. Their mission was to help struggling black communities. African Americans are still fighting a race war for equality today. But a newfound confidence has sprung up worldwide, as citizens feel more empowered. A good example of how to tap into that power can be found at Change.org, a website with a platform dedicated to letting anyone start a petition. For better or worse, people can organize almost instantly now and get their message across loud and clear. Standing on street corners and waving signs, hoping people will notice and perhaps honk their horns in support, doesn't cut it in this new age of technology. The age of people power is here. You are part of a revolution that will forever change the way things are done by local and national governments. As It Stands, it's exciting to see the ascension of the common man, but now the question is, where will it eventually lead us?